This month’s blog was written by self confessed ‘basketball nut’ Jose McGrotty! Hope you enjoy it and if you want to write a guest blog yourself, drop us a line at madridbasketball@gmail.com. Today, basketball games are probably one of the most widely viewed sporting events in the world. Originally invented in 1891 by Dr. James Naismith to keep his students occupied by a vigorous indoor game, this game has now become popular all over the world. From 1900, it gained recognition as a college sport and in 1937, the first National Championship Game was organized. A huge number of basketball teams emerged throughout 1920s and the following years. Finally, in 1949, the famous National Basketball Association was formed by the merging of Basketball Association of America and the National Basketball League. • The first basketball game was shown on television in 1932. • In 1932, eight nations joined together to form of International Basketball Federation. These countries were Greece, Italy, Latvia, Portugal, Argentina, Czechoslovakia, Romania and Switzerland. This was the FIBA which is the highest global regulating authority of basketball. • Basketball games came to be included in the Olympics for the first time in 1936 at the Berlin Olympics. In 1976, Women’s Basketball games were included in the Olympics. • The biggest winner at the Olympics is the USA Basketball team. They have won 13 gold medals. • In 2010, the longest marathon basketball game was seen in Hungary. The game was played continuously for 107 hours with no rest breaks. The final score was 9900 – 8169. • Today, basketball has become hugely popular as a college sports for both men and women. Women’s basketball began in 1892. It soon spread to many states and became very popular. 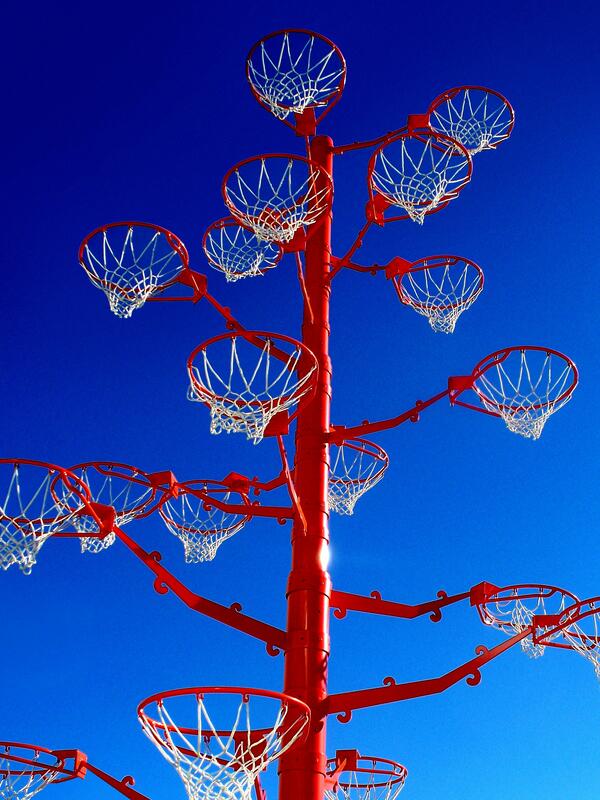 The famed Madrid Basketball ‘shoot some hoops with us’ tree. • A traditional eight panel basketball is the main thing necessary for a basketball game. For men, it has a diameter of 29.5 inches (size 7) while for women, it has a size of 28.5 inches (size 6). • Then, you require a basketball court. This game can be played both indoors and outdoors. By international standards, basketball courts are 91.9 feet long and 49.2 feet wide, though the measurement may vary a little. Basketball courts generally have wooden flooring. This entry was posted in Uncategorized and tagged expat basketball in madrid, madrid basketball, Madrid expats, play basketball in madrid, sport clubs in madrid. Bookmark the permalink.